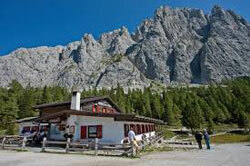 Rifugio Sorgenti del Piave - Located at an altitude of mt. 1830, - Reachable on foot with path n. 132, or by car. Summer opening, - Managed by the Piller Hoffer family. Ideal starting point for numerous climbs, on the south-south-east wall of Monte Peralba. From the refuge it is possible to admire especially on Sundays the exploits of climbers who climb on the walls of the Peralba Mountain, there are also numerous hiking trails also to the nearby Val Visdende, whose borders are about 300 meters from the Refuge, from here it is possible to descend Val Visdende on comfortable paths. 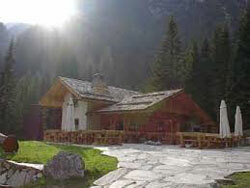 "Rododendro" mountain hut in Val Sesis is the starting point for excursions to the "Olbe" lakes. Alpine hut located at 1460 meters altitude reachable by car. 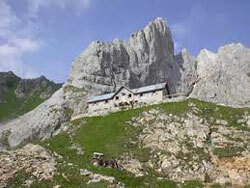 It is a very characteristic hut with typical mountain cuisine. 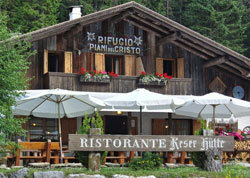 Piani del Cristo Mountain Hut - Located at Quota mt. 1410, in Val Sesis, can be reached on foot with path n. 132, or by car. 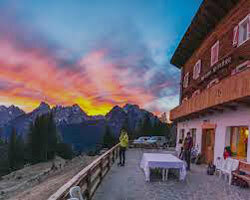 Mountain hut recently renovated, located in a sunny and panoramic position not far from the town center. It is reachable from several points, along the simple paths suitable for everyone. 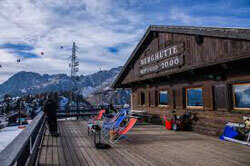 The mountain Hut is located at the arrival of the Sappada 2000 chairlift. It can be easily reached by chairlift in both summer and winter, or in summer by taking the Rientro di Sappada 2000 trail or the path that leads from the Rododendro Refuge to the Olbe lakes. The location is very scenic, and is equipped with a large solarium.